Author: Sarah Matthews UCL-MSSL; Mihalis Mathioudakis Queen’s University Belfast, Robertus von Fay-Siebenburgen University of Sheffield. 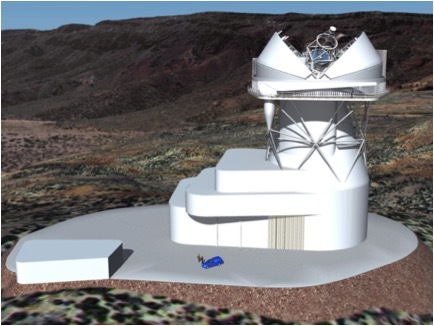 The European Solar Telescope (EST) is a pan-European 4m ground-based solar telescope planned for construction in the Canaries, with first-light in 2026. The EST consortium consists of 27 partners from 14 European countries, and is truly a testament to how great European collaboration can be! EST was one of only 6 new projects adopted onto the ESFRI Roadmap (European Strategy Forum for Research Infrastructures) in March 2016. This recognition of EST as a future major research infrastructure was a huge milestone for the project and moves it much closer to construction. Figure 1: An artist’s impression of how EST will look once constructed. 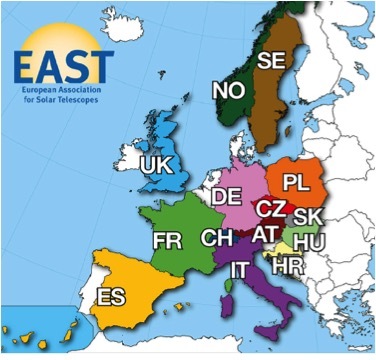 EST will also be able to address some non-solar astrophysics, looking at e.g. comets, Mercury, and planetary winds. So, why do we need EST if we have DKIST, you may ask! The EST, in contrast to DKIST and other solar telescopes, has an on-axis design with a polarimetrically compensated optical train. This unique design is optimized for the best possible polarimetric accuracy, simple and quick calibration and minimal instrumental effects. The telescope characteristics are approximately constant, which simplifies calibration and makes it extremely efficient for polarimetric observations of weak fields or in situations where the polarization orientation is important, such as Hanle effect observations. The EST design is expected to result in a polarimetric accuracy of 3×10-5. EST will also be the first solar telescope to incorporate Multi-Conjugate Adaptive Optics from inception, leading to greater image stability. One further advantage of EST is that it will be able to take advantage of the newest technologies for the first-light instruments. For example, the project has already developed a design for and manufactured a prototype of an image slicer for integral field spectroscopy and spectropolarimetry, as well as for a fibre spectrograph. This novel design removes the requirement to raster and gives you temporally simultaneous measurements. All in all, EST and DKIST would in fact be hugely complementary facilities, and we shouldn’t forget that their respective locations would also offer almost 24 hour coverage form the ground, weather permitting. Where are we at with the project and how is the UK involved? Figure 2: A map of the countries involved in EST. As we’ve already said, EST was adopted onto the ESFRI Roadmap earlier this year. Since then the consortium has successfully secured funding from the European Commission for the next 4 years to establish the legal and governance structures for construction and operation, with the UK leading the work-package on defining the legal structure. The UK has been involved in EST since the very beginning, and has contributed to the design efforts for the cameras for the focal plane instruments, as well as defining science requirements (UCL-MSSL, QUB, Andor Technology). We’re now looking to expand the UK’s role in areas such as adaptive and transfer optics, and data handling and processing for the telescope, taking advantage of the world-leading expertise of groups at Durham, Cambridge, UCL and Sheffield. We’re also establishing a UK Science Working Group to provide greater opportunities for all of the solar physics community to get involved.